The Nature Museum is part of the CT Department of Energy & Environmental Protection's State Parks Division. 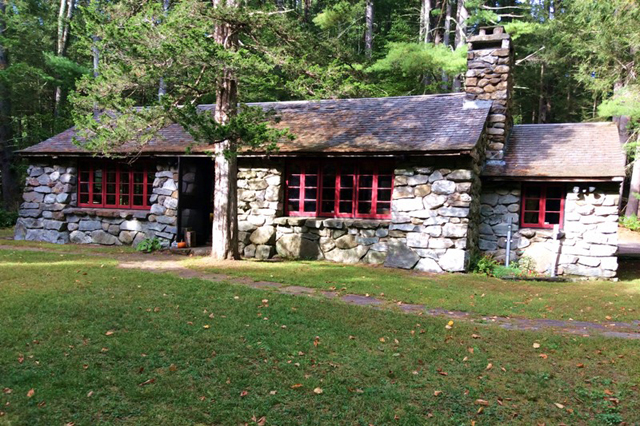 The Peoples State Forest Nature Museum, located on Greenwoods Road in Barkhamsted, Connecticut was built in 1935 by the Civilian Conservation Corps. It was open until 1942, when the CCC was decommissioned. The outside of the Museum, and the fireplace, are made from local fieldstone, some of which was taken from nearby stonewalls. The inside is paneled in American chestnut, which was harvested after it was destroyed by the chestnut blight. After sitting idle for 50 years, the Museum was reopened in 1992 under the direction of Marilyn Aarrestad, the Peoples State Forest supervisor at that time. It was reopened under a new name, "The Stone Museum." The curator for the next 15 years was Walter Landgraf. Upon his passing in 2007, the museum was again called "The Peoples State Forest Nature Museum." The purpose of the museum, then as now, is to educate people about local flora, fauna, and history. The area surrounding the Museum is rife with natural treasures and interesting tales from the early settlers. All this and more is reflected in the Nature Museum's displays, and through interpretive programs.